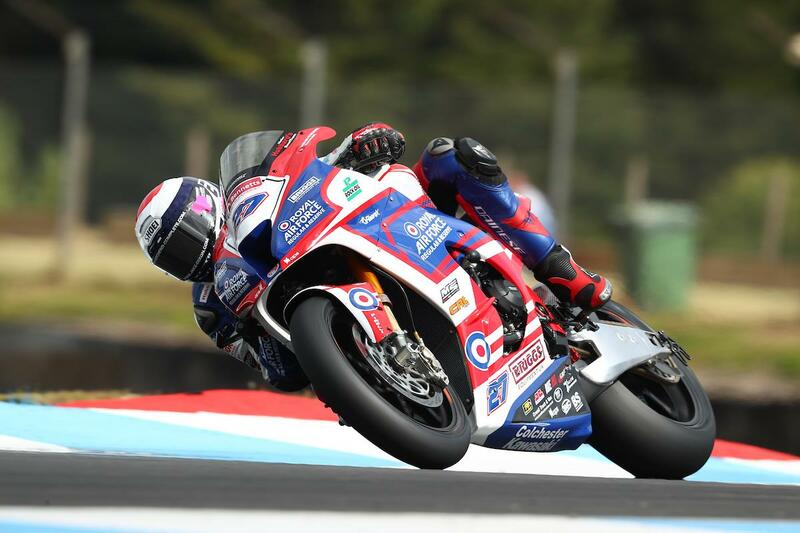 Jake Dixon took victory in a close fought opening Bennetts British Superbike race at Knockhill, holding off best mate Danny Buchan and series leader Leon Haslam for his third BSB win. Starting from pole, Dixon led into the first turn but Haslam was on the attack at the hairpin as he looked to take his sixth successive win. With the 1.3-mile Knockhill circuit fully resurfaced over the winter, the lap record was broken almost every lap in the early stages as the order established with Haslam leading Dixon, Glenn Irwin and Danny Buchan with Bradley Ray slotting into fifth. A new lap record for Buchan saw the FS-3 Racing Kawasaki on the move as he moved third behind Dixon. As Buchan made a move for second at the Hairpin in the final ten laps, Dixon put the hammer down to chase down Haslam’s 0.5 second lead. Haslam made it easy for Dixon as he ran wide at the hairpin, letting him past but as he returned to the racing line he narrowly avoided a collision with Buchan on the pace. The collision gave Dixon breathing space at the front, and while Haslam looked to get back in the mix it wasn’t enough. However, Buchan was later relegated to third place after an investigation revealed he overtook Leon Haslam under yellow flags. Dixon crossed the line 1.7 seconds ahead of Buchan in second with Haslam holding off a last lap charge from Glenn Irwin for the final podium spot. Bradley Ray finished fifth for Buildbase Suzuki ahead of the Tyco BMW duo of Michael Laverty and Christian Iddon. Josh Brookes was unable to turn his quick qualifying pace into a strong race result as he could only manage an eighth-place finish with Richard Cooper and Peter Hickman rounding out the top ten.